There should be two links above this line. Censorship is applied to stories of wrongful convictions, especially with the factors that such as George Allen faced: (1) deliberate falsification by police and prosecutors; (2) wrongful death penalty; (3) racism; and (4) a mentally or physically challenged victim. After Allen was freed, he had lunch with his mother, Lonzetta Taylor (pictured below). 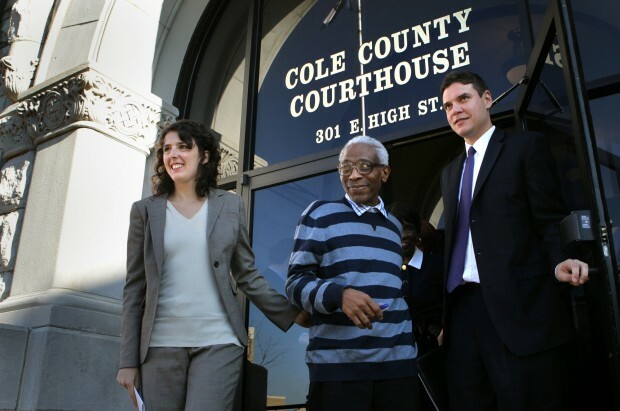 More cases may be examined that were investigated by the same detective who withheld information to win Allen's wrongful conviction. Mary Neal's Google Profile - http://www.google.com/profiles/MaryLovesJustice - Follow me at Twitter @koffietime - http://twitter.com/koffietime - Current, urgent justice issues from a laywoman's viewpoint at my primary blog http://FreeSpeakBlog.blogspot.com (the name is a joke, believe me). See also http://MaryLovesJustice.blogspot.com and DogJusticeforMentallyIll http://DogJusticeforMentallyIll.blogspot.com JusticeGagged http://JusticeGagged.blogspot.com Davis/MacPhailTruthCommittee http://DMTruth.blogspot.com Mary Neal at HubPages http://MaryNeal.hubpages.com .Recommended articles - http://topsy.com/site/freespeakblog.blogspot.com - Address: MaryLovesJustice@gmail.com (I am censored, but some emails reach my box) Try to phone me at 678.531.0262, however, none of us really has free speech, so they may prevent your call.